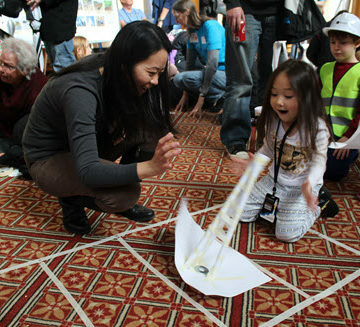 Kids test paper towers against winds from a box fan in the Windy City Tower activity. What is engineering? Look around you; it’s everywhere. The built world we live in is made possible by engineers who see challenges as opportunities and turn ideas into reality. 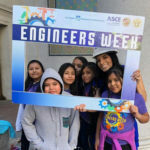 To encourage an interest in the STEM (science, technology, engineering, and math) fields, DiscoverE kicked off Engineers Week activities with Family Day, Feb. 17, in Washington, DC. 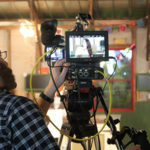 The event brought engineering to life for kids, educators, and parents. 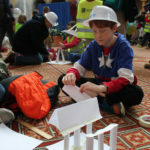 The National Building Museum transformed into a sea of aspiring young innovators as they explored, learned, and questioned engineering wonders. 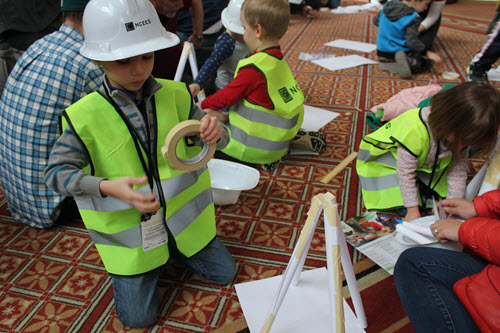 With their hard hats in tow, children participated in activities like racing balloon rockets, battling LEGO robots, creating slime, and mining for minerals. 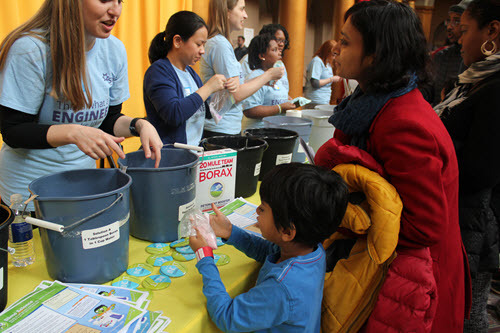 The American Institute of Chemical Engineers helps kids create slime. 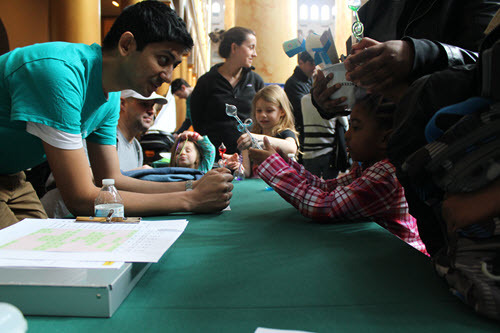 “Family Day activities are a good way to show kids what civil engineers actually do,” said Anay Shah, Geologist at AECOM and event volunteer. Among the many exhibitors at the event, ASCE National Capital Section members hosted the popular Windy City Tower activity. Featured in Dream Big: Engineering Our World, the exercise challenges kids to make a paper tower that can withstand as much wind as possible (from a box fan), without falling over. Kids design and build towers made out of paper and tape. The Section also promoted its book, Engineering the Nation’s Capital, which presents stories and images of notable infrastructure in the Washington, DC, area. Entirely volunteer-written, the hardcover coffee-table book hopes to offer a different perspective on engineering. Continuing outreach beyond Family Day, the Section plans to send local members to visit a school this year and present on an aspect of civil engineering. Each school will also receive their very own copy of Engineering the Nation’s Capital. Sumon Chatterjee, P.E., M.ASCE, environmental engineer at AECOM and event volunteer, shows attendees how to boil liquid using heat generated from the palm of their hands.